Scientists now know various pollinators have a preference for different-colored flowers. Honeybees, for example, are attracted to yellow and blue flowers; hummingbirds and butterflies to pink and purple ones. Although honeybees have a preference, I have also found honeybees on pink, red, and purple flowers, especially mid-summer when little else was in bloom. Flowers will stop producing pollen when temperatures go above 90°F, leaving honeybees with limited pollen sources to take back to the hive. Thanks to the tons of money being invested in finding out more about the little insect responsible for every third bite of food we eat, there are now regular scientific discoveries made about honeybees. One recent discovery was news even to many beekeepers, who used to describe this behavior as "grooming." Turns out honeybees aren't being fashionable or fastidious; they not only sting but they can also bite. I wondered what some of my bees were doing earlier this summer when I opened a hive to find them "rolling" a wax moth larvae away from the hive entrance. I had read that healthy hives can protect themselves from these invaders and assumed bees were stinging the larvae. After several bees converged on the wax moth larvae, I noticed none of the bees were dying. A bee can only sting once, then dies. Although the bees were still moving, the wax moth larvae had stopped. The bees were then able to roll it off the edge of the hive. Now I know the bees were biting the wax moth larvae. Researchers have discovered that honeybees use their tiny mandibles to paralyze victims with a snake-like venom. The secretion left by the bite was found to be similar to Lidocaine, the dominant local anesthetic used in humans and other mammals. 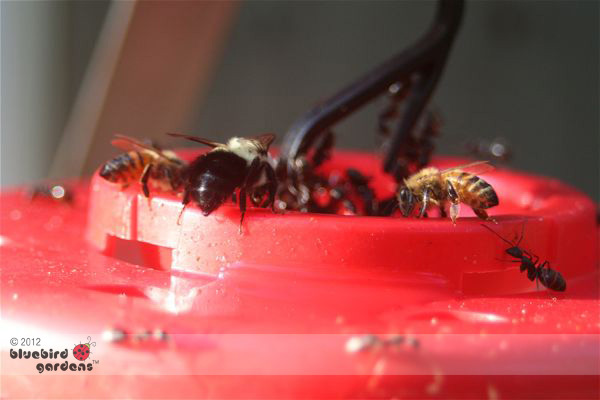 Like a snake bite, the secretion contains a natural anesthetic that paralyzes the victim for 6-10 minutes so the pest can be dragged out of the hive. The finding could help scientists develop ways to help bees fight off viruses that are affecting the wider bee population. 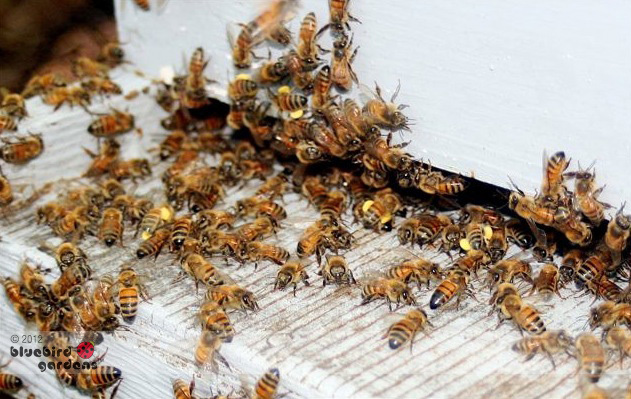 Dr Max Watkins, a former researcher at Cardiff University, said the anesthetic may not only help honeybees fend off pests such as wax moths and the parasitic varroa mites, but it also has great potential for human use. The natural anesthetic is 2-heptanone, a compound found in many foods. It is also secreted by certain insects but never before understood to have anesthetic properties. Until recently, research seemed to indicate that 2-heptanone was either a honeybee alarm pheromone that triggers defensive responses, or a chemical marker signaling to other foraging bees that a flower had already been visited. The compound is found naturally in many foods such as beer and white bread, and is so safe that USDA allows it as a food additive. That's a bear of a discovery! It's interesting to see what flowers bees visit every season. In fall, my honeybees were all over Autumn Sedum flowers. Although bees prefer yellow and blue flowers, they don't seem picky when pollen starts to be scarce. Besides pollen, bees also need a source of water. I have several birdbaths around my property bees regularly visit. I added rocks and twigs to give them a safe landing spot. They also seem to prefer water with flavor, such as leaves and other garden debris. Hummingbird wings beat 53 times a second. Honeybee wings beat 200 times a second, or 11,000 times a minute. Bees use that motion in summer to help stay cool. They will line up at the hive entrance, facing inside, and use their wings to move air through the hive. I have one lavender planted in my raised bed vegetable garden. 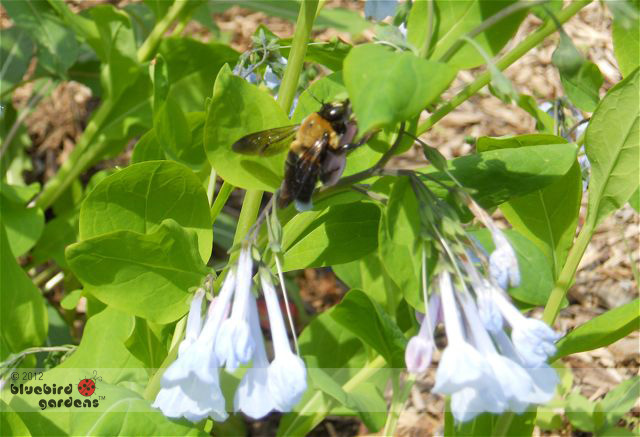 Every morning, I find a number of bees in the flowers including Missouri bumble bees. Bees love most herbs so if in doubt what bees like to visit, plant herbs! Sugar Water Attracts Butterflies, Too! 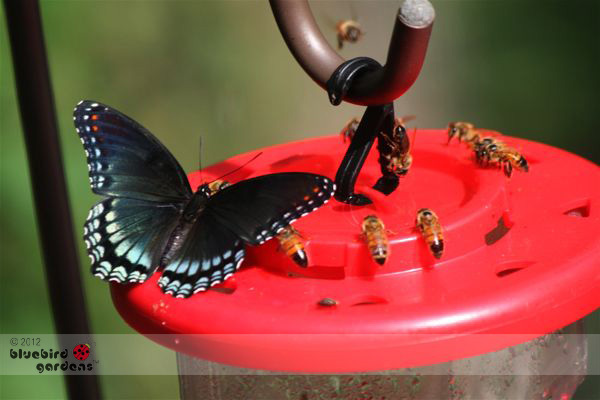 Besides ants and a variety of bees, sugar water also attracts a variety of butterflies such as Red-Spotted Purple Butterfly. See the red dots on the butterfly's wing tips? Beautiful butterfly, especially when sun reflects off of it. Bird feeders with sugar water attract more than just hummingbirds. 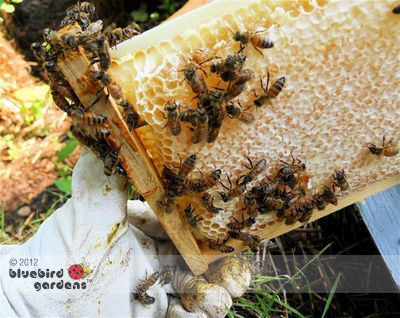 Bees need food to maintain their busy honey-producing schedule. One of my sugar water feeders was host to ants, sweat bees, honeybees, and one very large wild Missouri bumble bee, all at once. When hive temperatures get too hot, worker honeybees inside push field-going bees outside to try to reduce the inside hive temperature. Bees "hang out" outside the hive, forming a "beard." This is a good indication the hive needs to have the hive top cracked open to generate ventilation. A honey bee visits 50 to 100 flowers during a collection trip. A bee travels an average of 1,600 round trips in order to produce one ounce of honey; up to 6 miles per trip. I'm exhausted just thinking about all that traveling! 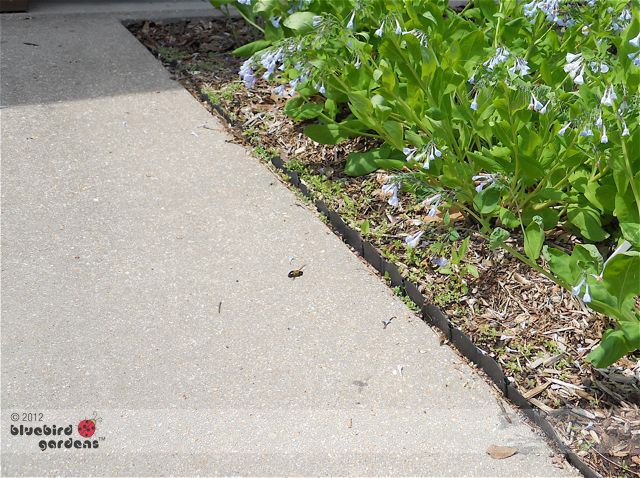 To keep my bees happy, I continue to add plants to my garden that offer them pollen sources throughout the year. 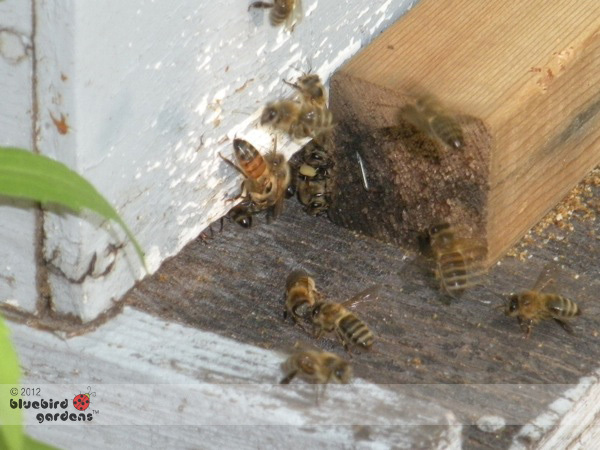 Bees keep the hive inside at 90F since they're also managing a nursery. To help bees keep the hive warm in winter, and to minimize intruders like mice, beekeepers close hive entrances with "entrance excluders." I also pop the excluder on if temperatures get too cold some spring nights. Once danger of frost is over, the excluders are removed until fall. I also re-attach excluders when we have warnings of major storms and hail damage. I lost about 1,000 bees the first year I had two hives due to hail hitting the hive entrance at an angle. One of the most wonderful scenes at a bee hive is the arrival of bees "packing pollen." Bees will fly about 2 miles from the hive to find a pollen source. After getting their leg pouches full of pollen, bees will fly back to the hive and sometimes literally fall into the hive with their heavy baggage. Their pollen-filled legs are obvious as they slide into the hive entrance. Once they lighten the load, they do a little waggle dance to communicate to other bees where they found pollen. Pollen is the basic ingredient bees use to make honey. Bee Hive Clean Up "Crew"
Do you see what I first spotted after taking this picture? Bottom right, at the front of the hive - a lizard. At first I thought oh no, another predator eating my bees! After watching it for awhile, the lizard went back to its clean up patrol, eating dead bees along the front porch of the hive. 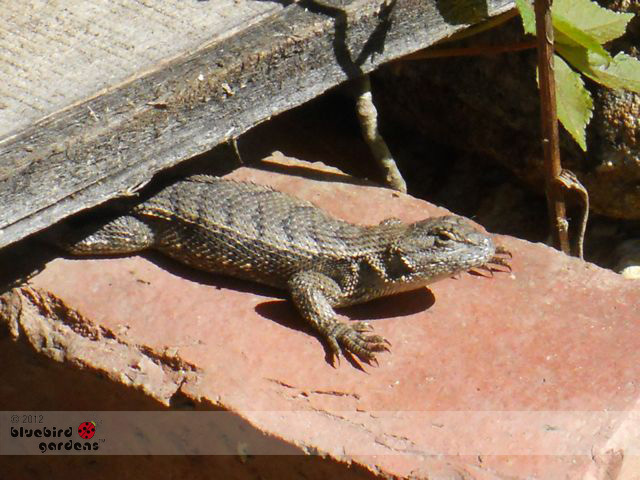 My bee mentor confirmed later that lizards play an important role around a hive, keeping the area clean. My, How Big You Are! One of the larger wild bees in my garden is the carpenter bee. The carpenter bee literally drills holes in wood to lay eggs and raise brood. About as big as a bumble bee with a smooth black back, these large, solitary bees flit from flower to flower with acrobatic grace, moving quickly, and sometimes dizzily, until they find a place to light. According to US Department of Agriculture, beekeepers loose about 30 percent of their hives during winter. Although there are a number of theories why honeybees are dying in record numbers - one out of every three fruit or vegetable we eat is courtesy of honeybee pollination - not having enough good pollen sources is sometimes mentioned as one of the factors. After getting my two honeybee hives settled in, I thought I would find a list of favorite honeybee plants and start adding them to my garden. It wasn't that easy. My assignment was to find one of my honeybee queens and (sigh) kill her. One of my two honeybee hives had been struggling. The verdict from more experienced beekeepers was that my queen bee - she's the only one in the hive of 40,000 plus honeybees that lays - is not laying her 1,200 eggs or so a day so she needs to be removed. Normally a queen bee will live 4-5 years, as opposed to a worker bee's 6 weeks of life producing 1/12th of a teaspoon of honey. 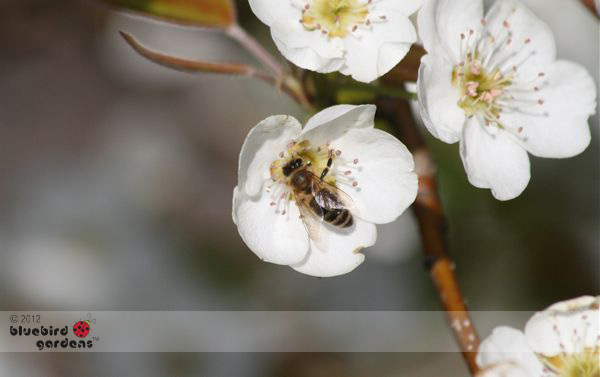 The color and flavor of honey differs depending on the bees’ nectar source, the blossoms. In fact, there are more than 300 unique kinds of honey in the United States, originating from such diverse floral sources as Clover, Eucalyptus and Orange Blossoms. In general, lighter colored honeys are mild in flavor, while darker honeys are usually more robust in flavor.